I really wanted to make champagne cupcakes for New Years. I’ve seen several versions on Pinterest, but really wanted to put my own spin on them. I learned how to seed and juice a pomegranate at work last week, but before that I had sort of never eaten, held, or touched a pomegranate. Like, ever. But it was actually really fun and they’re just so gorgeous. 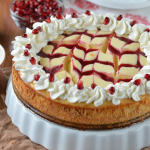 I passed them in the grocery store the other day and decided to add something pomegranate flavored to this recipe just for fun. For some reason I decided to make fresh pomegranate juice. It’s a really awesome color, but y’all. That’s a long process. Anyway, I boiled the juice of one pomegranate down to a little less than 1/4 cup so I could use it in half of the frosting. Yeah, I didn’t really have anything to do today. You can totally buy pomegranate juice instead of going through the whole seeding and juicing process if you want. I just wanted to take the long way since I recently learned how to do it. And you’ll only need about a tablespoon of it. You could probably make some fancy champagne/New Year’s cocktail with the rest of it though. For Christmas, my dad made me the tabletop in the picture below. My dad put some boards of wood together, we painted one side white, one side dark gray, and then he scuffed them up with sandpaper. So now I have some cool new surfaces to take pictures on! He did a blog post on his own blog here! To get a really concentrated champagne flavor without using tons of champagne, I measured out 1 1/2 cups and boiled it down to about 3/4 cup. I used most of it for the cake batter and saved about 2 tablespoons for the champagne frosting. The champagne flavor is definitely present in the cupcakes, but it isn’t anything wild and crazy. It’s more in the undertones, but it’s just right. I wasn’t sure how moisturizing champagne would be since it’s all bubbly, but it worked really well! I was surprised when the cupcakes were baking up in the oven that the tops got a little more toasted than I was expecting. I kept checking to make sure the inside was done, had to keep putting them back in the oven, and was afraid I over-baked them. But they were just right once I bit into one. Most of my problems would be solved if I could get this one down. More exercising. The time management thing will help with this. 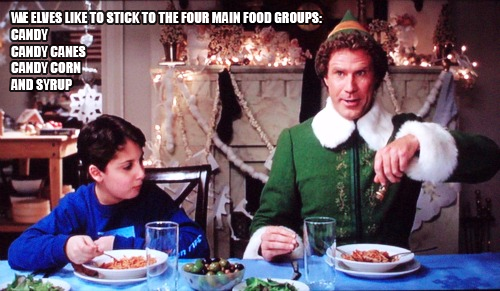 I am an unreasonably picky eater, and honestly, I’m really tired of it! It’s hard to eat healthy food when you don’t like most vegetables and fruits. 5. Do more of what makes me happy. 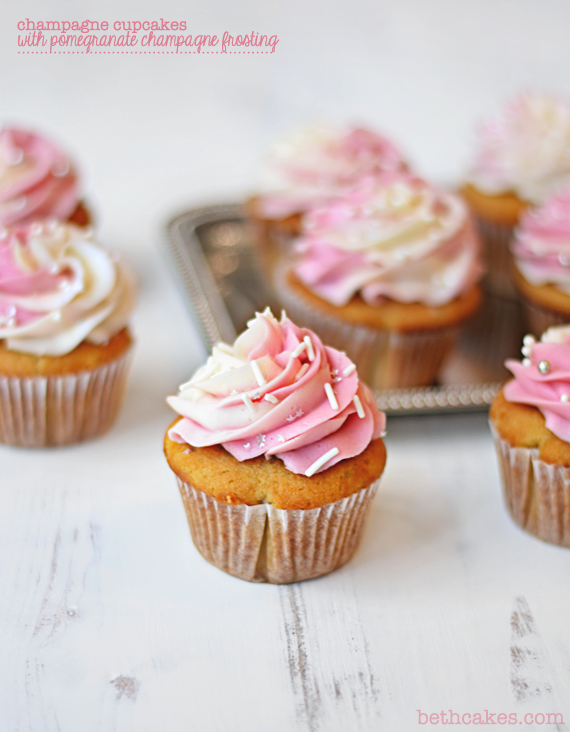 As much as I love baking, cupcakes, and frosting, sometimes they don’t make me feel great. I used to be pretty into music, and I’d like to get back into that. Here’s a secret: I really love singing. It makes me feel better no matter what. I’m ridiculously shy though, so I never tell people that. This is a weird one. It’s one of those things that you have to baby-step. Sounds lame, but it’s true. Just yesterday I didn’t have any New Year’s plans, and now all my friends from college are coming to my house! I’m beyond excited. Unfortunately, these cupcakes probably won’t make it to Tuesday night. Oh well! In a small saucepan over medium high heat, bring 1 1/2 cups of champagne to a bowl. Reduce heat to medium, and let it simmer 7-10 minutes. (Once the champagne had been reduced to almost half, I poured it into a measuring cup every now and then until it was 3/4 cups.) Transfer it to your freezer while preparing the cake batter. Do the same thing with the pomegranate juice. (You can do them at the same time if you want.) To remove the seeds and juice them, I did this minus the sugar. 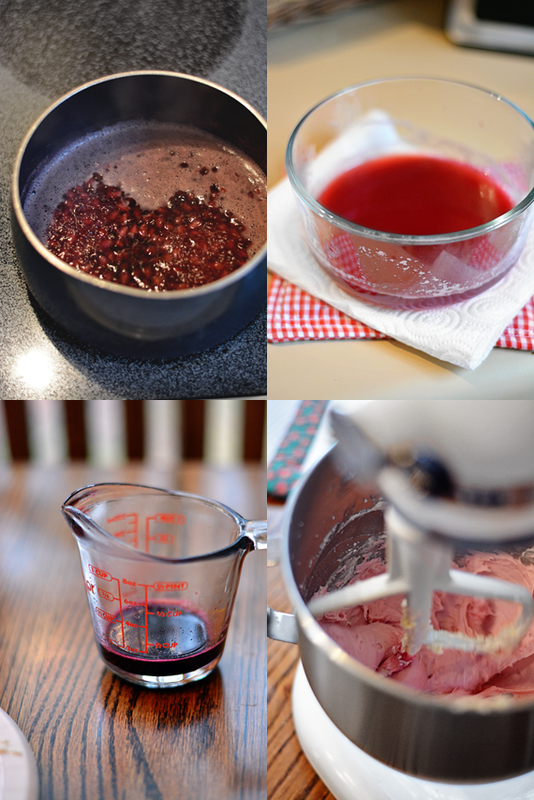 In a saucepan over medium-high heat, bring the pomegranate juice to a boil. Lower the heat to medium/medium-low and let it simmer for 5-7 minutes. (I did the same thing with the champagne - just kept measuring it until it was a little less than 1/4 cup. You only need 1 tbsp for the frosting. Feel free to use store bought, and reduce or don't reduce.) Store juice covered in the fridge. Preheat oven to 350 degrees and line a cupcake pan with paper liners. In one bowl, whisk together flour, baking soda, and baking powder. In another bowl, or the bowl of a stand mixer, cream butter and sugar on medium speed until incorporated and fluffy. Add the egg whites and vanilla, and mix well. Add half of the flour mixture to the butter/sugar mixture. Remove the champagne from the freezer and measure out 1 tbsp. (I just put it in a tiny cup in my fridge.) Add half of the champagne to the butter/sugar mixture. Mix until flour and champagne are incorporated. Repeat with second half of flour and champagne. 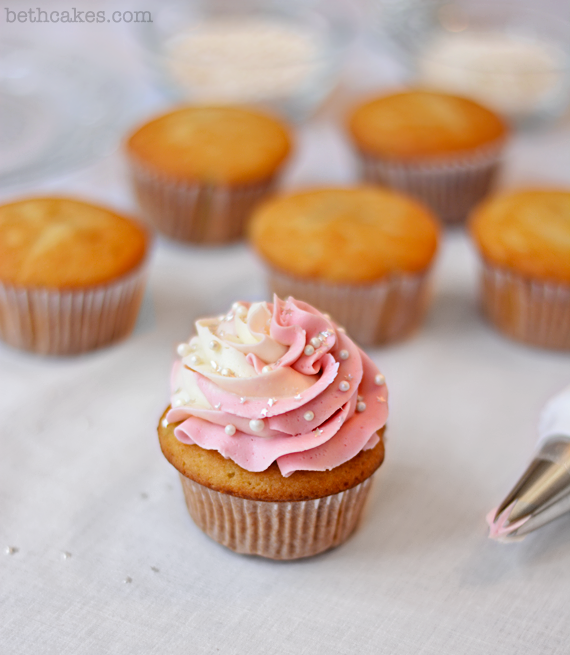 Scoop cake batter into the cupcake pan and bake for 15-17 minutes, or until a toothpick can be inserted into the center of a cupcake and it comes out clean. In a medium sized bowl with a handheld mixer, or the bowl of a stand mixer, cream butter on medium-high speed until smooth and creamy. Add champagne and mix well. Add half the powdered sugar and mix on low until mostly combined. Then mix on medium/high until fully incorporated. Repeat with the second half of the powdered sugar. Store frosting in the fridge while you whip up the pomegranate frosting. Add pomegranate juice and mix well. Here's how I do this. You'll need a large cup, a piping bag (I used a 16 inch), and a large star decorating tip. 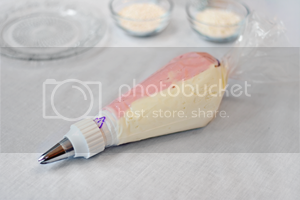 Snip off the end of the piping bag and position the tip. Put the bag in the cup and fold the edges down over the cup. 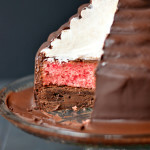 You have the champagne frosting (make sure it's not too hard from sitting in the fridge) and the pomegranate frosting. Using a rubber spatula, add a scoop of champagne frosting to the bag by scraping the spatula on the edge of the cup. The frosting should sort of stay there, maybe slide down a little. Do the same thing with a scoop of the pomegranate frosting on the other side of the cup. Repeat. Once all the frosting has been added to the bag, pipe away! GORGEOUS! I’m with you on pretty much all of your resolutions, including being less shy 🙂 Here’s to a fabulous 2014! Thanks, Jennifer! Here’s to 2014! 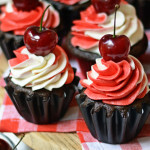 There are good cupcakes and then there are these – killer! Very flavorful and so cute too. 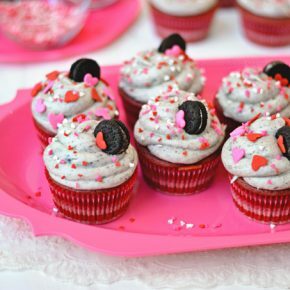 These cupcakes are beautiful! 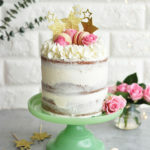 I love the swirled frosting and YES PLEASE to champagne in desserts! so pretty!! love the sprinkles! These sound awesome and are PERFECT for New Years! 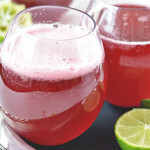 I would probably just buy pom juice, but I love that you made it yourself! Thanks, Lily! 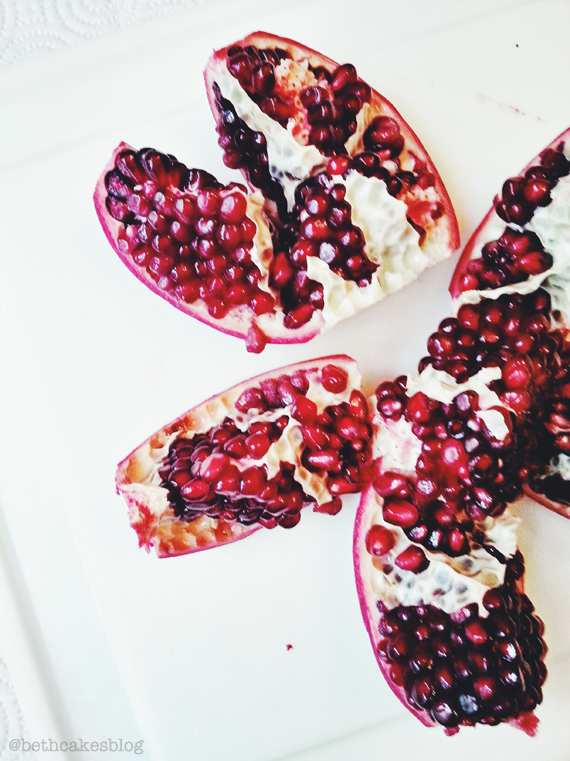 You can definitely just buy pomegranate juice. I just wasn’t sure what I’d do with the rest of it, haha. Thanks, Chelsea! Hope you had a wonderful New Year’s! These are just the prettiest little things ever!!! 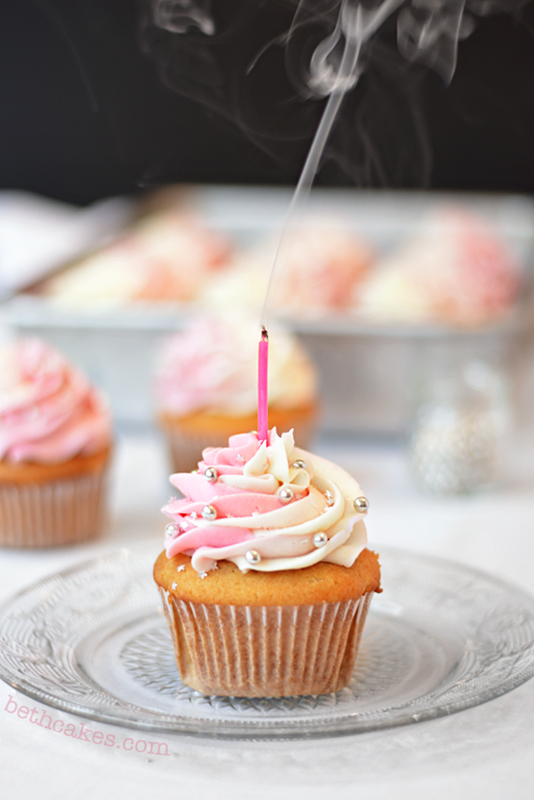 I love that photo with the candle that was just blown out with the smoke all billowing around! So cool!! Great goals by the way! Beautiful!! 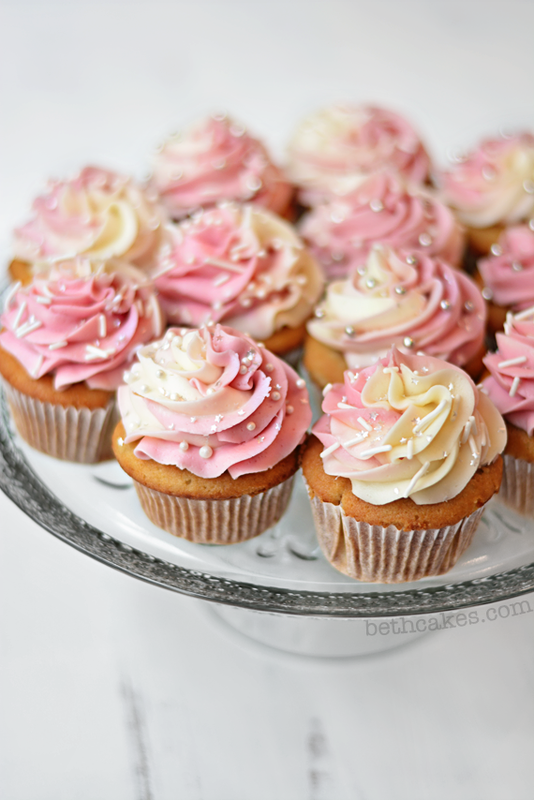 Absolutely forgeous cupcakes. Love them Beth! What a great idea to reduce the champagne, I didn’t get much for the flavor in my frosting by just using a few tablespoons. Next time (ahem tomorrow), I will use your technique. Thank you for sharing!! Happy New Year!! Can’t wait to see what 2014 brings!! 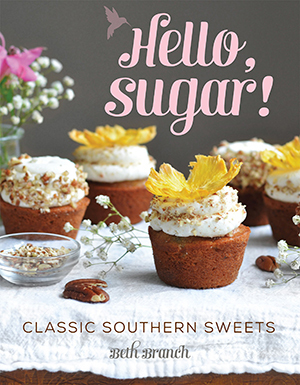 Oh my gosh – could these be any more beautiful? When I brought your page up, I literally said “OH MY GOSH! Beautiful!” out loud, which I think my husband will find kind of strange, since it’s 4 a.m. in the morning. 🙂 These look absolutely fantastic, and I love how gorgeous and festive they are. 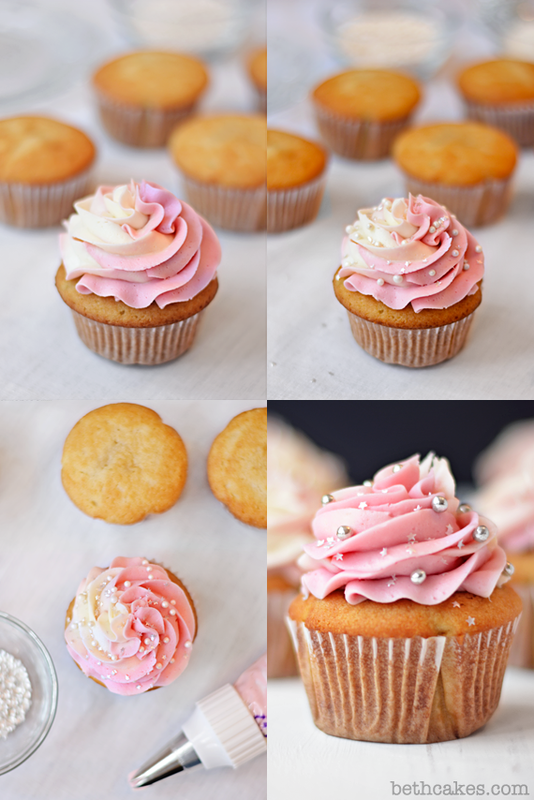 Pinning to my Cupcake board – but if I had a board called “Beautifu!” I’d post them there too! Have a Happy New Year! Gorgeous work here! And you’re so right–reducing everything is crucial for a big flavor punch. Happy New Year! Thanks so much! You’re right, the reducing really is important in these recipes. Hope you had a wonderful New Year’s! Great goals and beautiful pink cupcakes! Gorgeous photos! Especially that one at the end with the flame dying out from the candle. I love the surfaces too, your dad did a great job. Dads are awesome for making photography surfaces 🙂 I have one of my own but still have to do the painting job. And as for the cupcakes, absolutely beautiful and a great way to ring in the new year!! Thanks, Katy! Dads are definitely awesome at making things for photography props! There beautiful Beth, so so pretty. Love your styling and photography! 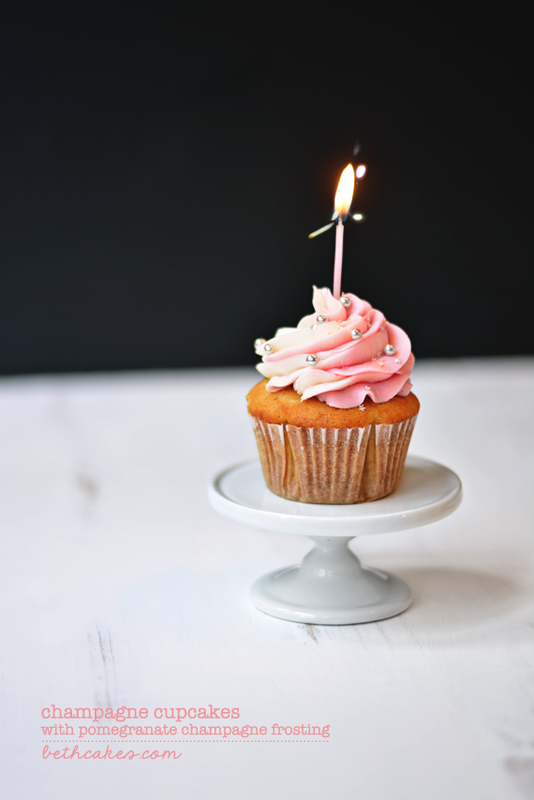 I love getting a mix of Champagne Cupcakes with Pomegranate! 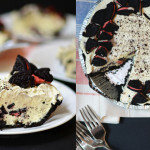 I’mto make this asap!